This exoplanet - as astronomers call planets around a star other than the Sun – is the smallest ever found up to now and it completes a full orbit in 13 days. It is 14 times closer to its star than the Earth is from the Sun. 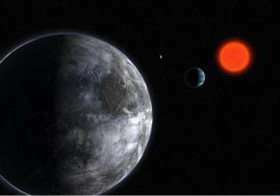 However, given that its host star, the red dwarf Gliese 581, is smaller and colder than the Sun – and thus less luminous – the planet nevertheless lies in the habitable zone, the region around a star where water could be liquid! "We have estimated that the mean temperature of this super-Earth lies between 0 and 40 degrees Celsius, and water would thus be liquid," explains Stéphane Udry, from the Geneva Observatory (Switzerland) and lead-author of the paper reporting the result. "Moreover, its radius should be only 1.5 times the Earth’s radius, and models predict that the planet should be either rocky – like our Earth – or covered with oceans," he adds. "Red dwarfs are ideal targets for the search for low-mass planets where water could be liquid. Because such dwarfs emit less light, the habitable zone is much closer to them than it is around the Sun," emphasizes Xavier Bonfils, a co-worker from Lisbon University. Planets lying in this zone are then more easily detected with the radial-velocity method, the most successful in detecting exoplanets. Two years ago, the same team of astronomers already found a planet around Gliese 581. With a mass of 15 Earth-masses, i.e. similar to that of Neptune, it orbits its host star in 5.4 days. At the time, the astronomers had already seen hints of another planet. They therefore obtained a new set of measurements and found the new super-Earth, but also clear indications for another one, an 8 Earth-mass planet completing an orbit in 84 days. The planetary system surrounding Gliese 581 contains thus no fewer than 3 planets of 15 Earth masses or less, and as such is a quite remarkable system. The discovery was made thanks to HARPS (High Accuracy Radial Velocity for Planetary Searcher), perhaps the most precise spectrograph in the world. Located on the ESO 3.6-m telescope at La Silla, Chile, HARPS is able to measure velocities with a precision better than one metre per second (or 3.6 km/h)! HARPS is one of the most successful instruments for detecting exoplanets and holds already several recent records, including the discovery of another ‘Trio of Neptunes’. HARPS is also very efficient in finding planetary systems, where tiny signals have to be uncovered. The two systems known to have three low mass planets – HD 69830 and Gl 581 – were discovered by HARPS.